Why are the SEO WordPress themes important? There are various ways the Search Engines rank your site. Generally, there is on-page SEO, and there is off-page SEO. As a website owner, you must do your part to make your on-page SEO great. The first step is using the keywords in the title, meta description, and content correctly. You can use plugins such as Yoast SEO, all in one SEO, etc. to make your content SEO ready. Just choose the best SEO plugin for your site to start optimizing your content. Most of the SEO WordPress themes are compatible with these plugins and have faster loading time. Therefore, there are many reasons to use SEO WordPress themes. SEO friendly WordPress themes have features that make your site ready for the search engines. First of all, the optimized code of the SEO friendly WordPress themes helps to deliver the best quality content to the search engines. Secondly, these SEO friendly themes are usually designed to have excellent page speed which helps to boost your site’s SEO. Likewise, these themes have better compatibility with the best SEO plugins. So, you can easily create SEO optimized content for better search engine results. Now, let’s take a look at 20+ best free SEO WordPress themes that will help rank your site better. Zakra is one of the best SEO friendly WordPress themes. It has 10+ free starter site templates which give your site a professional look. First and foremost, this theme has clean codes and follows the best SEO practices. The title tags provide important content to the search engines. And, the codes are updated from time to time make the site loading time faster. This ultimately helps to boost your site’s SEO. It is also fully responsive. Moreover, you can customize as per your requirements as this theme is created with page builders in mind. It offers the general layouts for pages and posts such as a full-width, left sidebar, right sidebar, etc. And, you can add widgets of your choice in 7+ widget areas. Not only this but, you can add custom CSS to tweak the design of the theme to fit your style. 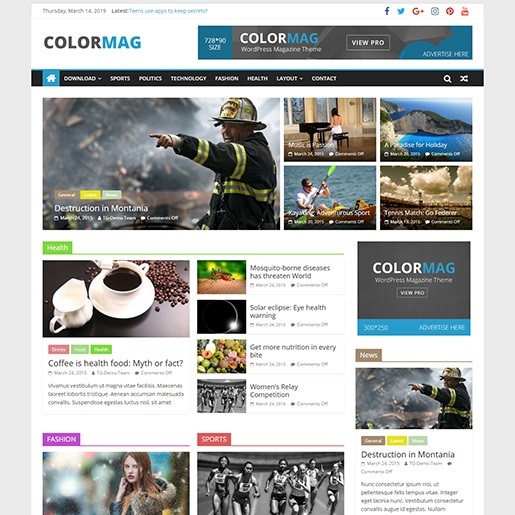 ColorMag is the perfect WordPress theme for news, newspaper, magazine, blogging sites. It is responsive and SEO friendly. It follows the best SEO practices for great SERP rankings. With its clean codes, your site will load very fast. It has a primary color option that you can choose to implement on your site. You can add 5+ widgets in 15+ widget areas. You can even write your custom CSS to change the design of the theme. And, it’s extremely easy to create your site with this theme with the demo content. There are other options like site logo, header image and option to link header image to the homepage. Furthermore, this theme is WooCommerce compatible and translation ready which is great for any website. OceanWP is the most popular SEO WordPress theme among WordPress users and developers. It has a built-in SEO base that makes your site optimized for SEO. And, it has the fastest page load time with the highest grade in most of the speed testing tools. Its extendable code makes it a joy for developers to extend and customize. This theme supports most of the popular page builders so; you can customize as you wish. 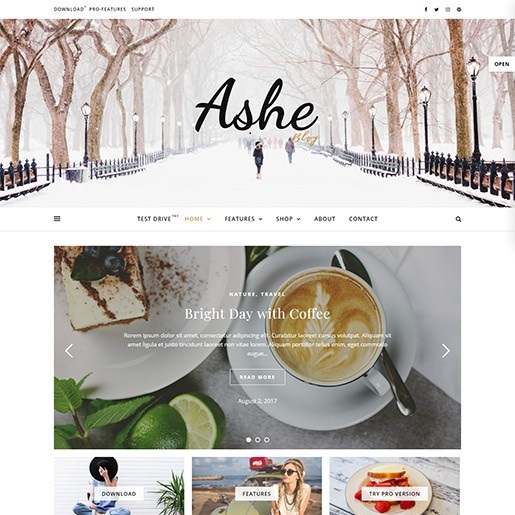 Hence, this multi-purpose theme is the perfect choice for all types of websites such as business, portfolio, e-commerce, photography, etc. It is fully responsive so your site will look great on all types of devices. You can also translate the site to your own language. All-in-all, it is an awesome theme that suits all niches and has features that are great for a free one. 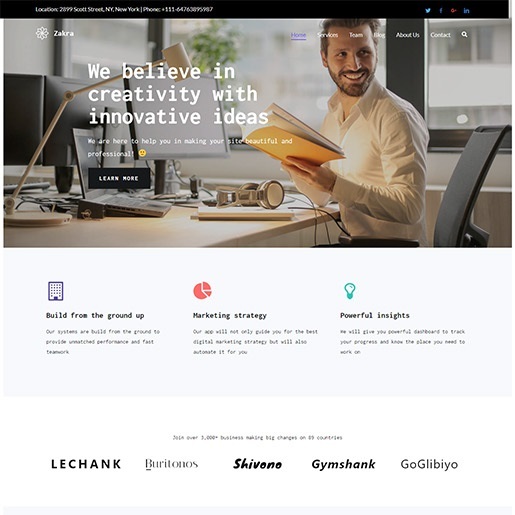 Neve is yet another multi-purpose SEO WordPress theme that is great for all sorts of websites such as blogs, small business, startups, agencies, etc. It is fully AMP optimized and responsive so, your site will load pretty fast and adapt perfectly on any device. Most importantly, it is SEO optimized meaning it has a clean source code that does great with search engines. It has clean codes to make your site faster. It is also built to support the best page builders in the market like Elementor, Divi, SiteOrigin, Beaver Builder, Brizy and many more. You can even change the background to the custom image, media slider, video, etc. You can customize as you like with a real-time preview of your page with Live Customizer tools. And, it is easy to set up with demo content available. Sparkling is a clean, modern, flat design theme which is fully responsive. This free theme provides features that are no less than any premium theme in the market. The pixel perfect design, awesome widgets, and full-screen slider make it stand out from many themes out there. It is also one of the SEO WordPress themes that have a Schema compatible structure which makes search engines love your site. And, this theme supports almost all the plugins such as Gravity Forms, Contact Form 7, SEO by Yoast, W3 Total Cache and many more. So, you can use it for personal and corporate websites in health, fitness, education, finance, business, or any other niche. Moreover, you can get creative with this theme by changing dozens of theme options for customization. 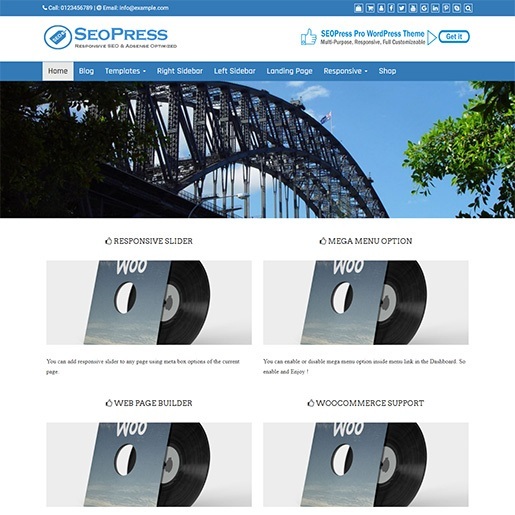 SEOPress is one of the SEO WordPress themes that follow the standard WordPress rules of theme development. It is a secure and reliable theme with a responsive design. This theme will boost the ranking of your website in search engines because it follows the latest Google Webmaster Guidelines and structured data implemented according to schema.org project. It is also very customizable with 200 theme options to edit page sections as you wish. Moreover, you can customize your site in real time with the live customizer tool. 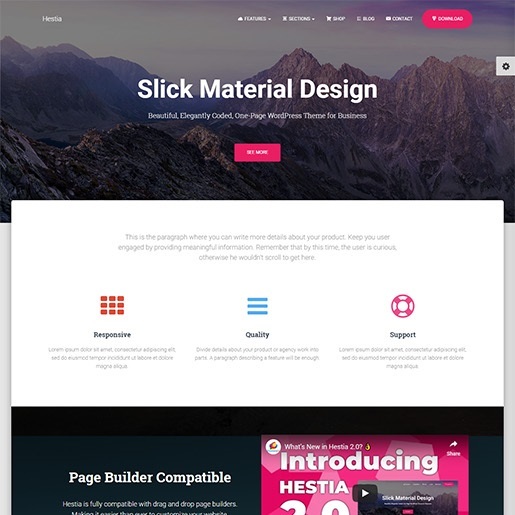 This theme also has special page templates for page builders, and it is compatible with all page builder plugins. Even if you want to create your site in your own language, you can easily translate all texts. Hestia is yet another SEO WordPress theme that gives your site a clean, modern and professional look to your site. It is the perfect theme for businesses like restaurants, online shops, startups, etc. With this theme, you have the freedom to edit, adjust and make various changes in the real-time preview using the live customizer tools. Not only this but, you can change the theme background to any type of media such as image, video, etc. 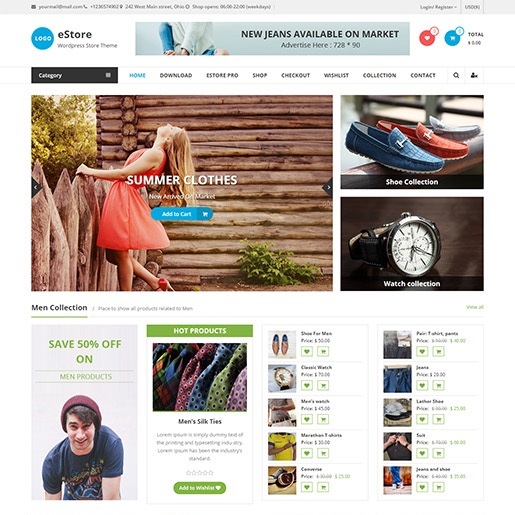 This theme offers various features such as WooCommerce compatibility and page builder support. But the most important feature that a WordPress theme must have is SEO optimization and, this theme fully SEO friendly. So, be assured that your site will have a strong online presence. 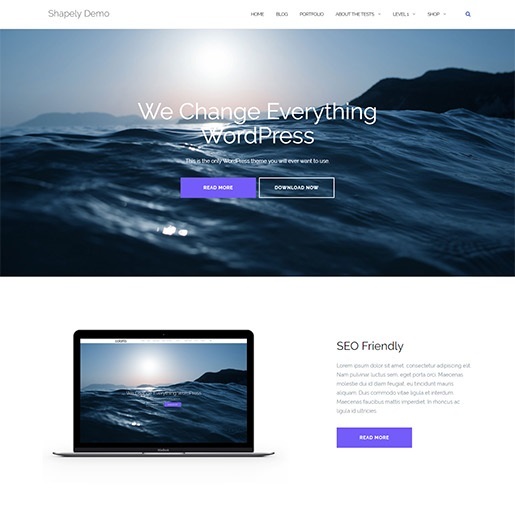 Shapely is yet another SEO optimized WordPress theme that has advanced features like a premium theme. First, it is completely responsive which makes your site optimized for any type of device. It’s flat, and retina ready design offers great features like razor-sharp text, vibrant color, stunning graphics, and sharp images to your site. You can also customize your site with options to edit footer, copyright information, change element color, add hero image, tweak sections and much more. Moreover, this theme supports all the major free and premium plugins. Most importantly, this theme delivers the best SEO results with the well-optimized structure and code. You also have the option to customize the theme with unlimited colors. 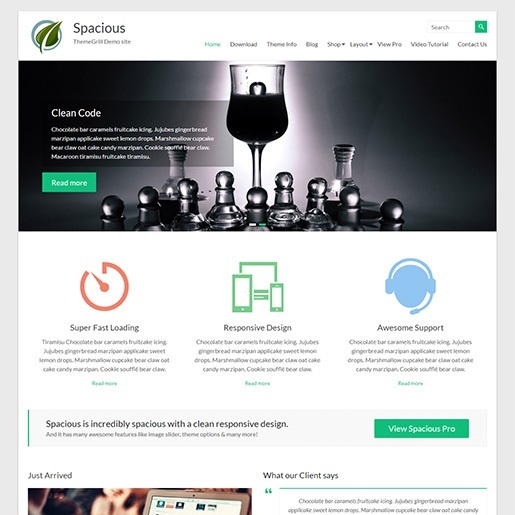 Spacious is one of the most popular SEO WordPress that is perfect for business websites. It includes business template and, custom widgets specially targeted towards creating beautiful professional looking business sites. The various widgets include featured widget, featured single page widget, call to action widget and services widgets. It is also compatible with WooCommerce and Breadcrumb NavXT. You can even translate this theme with your preferred language because it is translation ready and supports RTL. Setting up your site is a piece of cake with the demo content available. Above all, this theme is SEO friendly with clean and optimized codes. Lastly, it is compatible with WooCommerce for you to start your online business with ease. 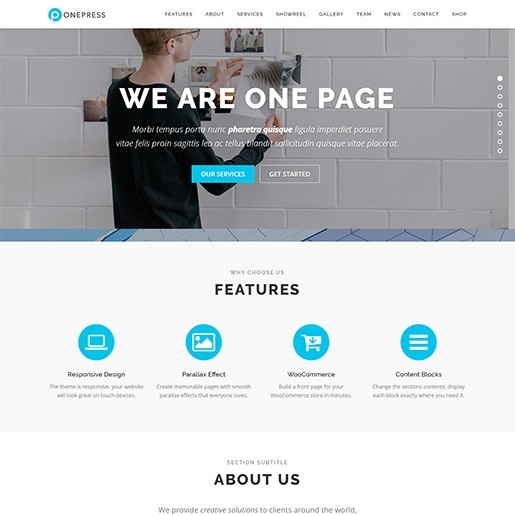 OnePress is a creative, flexible and free one page SEO WordPress theme. It has a great design that suits well for business, portfolio, digital agency, product showcase, freelancers and many more. It has a responsive design and adapts well to many devices as screen sizes. This theme offers a built-in customizer so you can change the aspects of the design as you wish. It has the custom content blocks feature so, you can showcase your company info, services, clients, videos, gallery, latest posts, etc. You can also add custom theme widgets and a custom page template. So, you can customize as per your requirements. It is also translation ready, so you can translate the theme into any language you require. 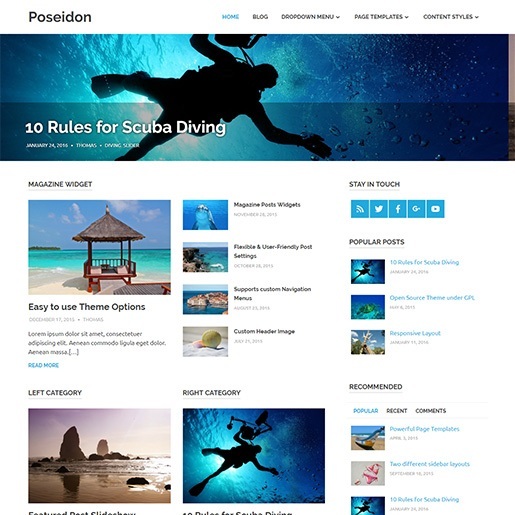 Poseidon is an elegant SEO WordPress theme that adapts well to all kinds of screen sizes. You can add a beautiful full-screen image post slider which highlights your most important posts. You can also easily configure the settings, choose a slider category, slider speed, number of slider posts and slider animation effect. This theme has a magazine homepage template so; you can create a magazine-styled homepage in seconds. There is a built-in custom magazine posts widget to display the latest posts. It also supports three different magazine posts widgets (Boxed, Columns, and Grid). This theme follows the best code practices and has SEO optimized code for better ranking of your site. The theme offers many other features that make it perfect for any site. 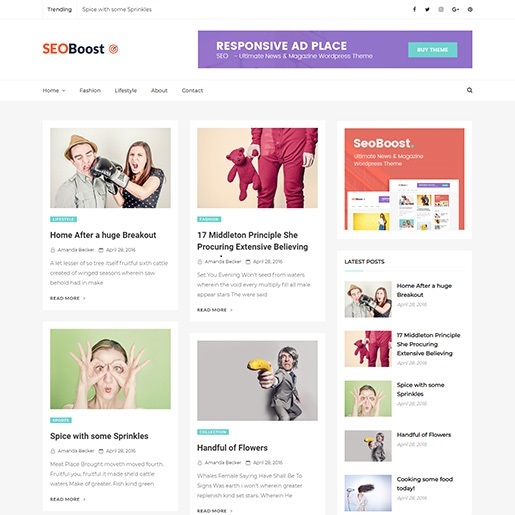 SEOBoost is the perfect SEO WordPress theme that has a simple and clean look. It is designed with visitor engagement and search engines in mind. The theme is also page speed optimized for right up time and better visitor experience. Even though it has a simple design, it has many features. You can customize the theme with the unlimited color options and google fonts selector features. 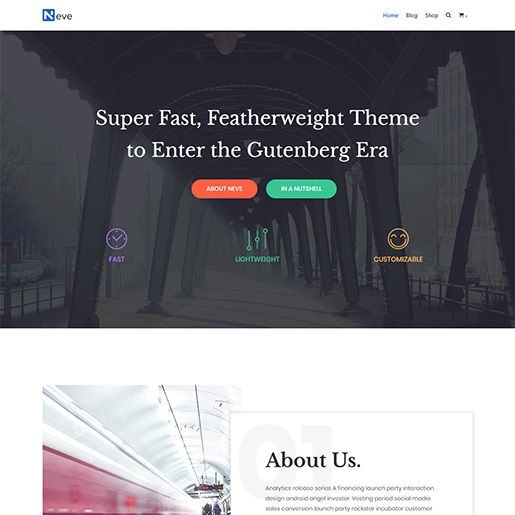 This theme has a clean layout and straightforward typography which is great for blogs and magazines. Likewise, it has a responsive framework so, your site adapts to any device. 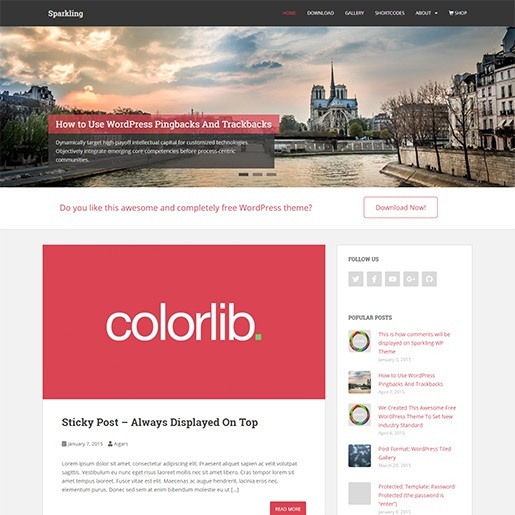 This theme follows the WordPress best practices so, you can be assured that the theme meets the standards. Lastly, it is compatible with all modern browsers. Flash is the easiest and flexible SEO WordPress theme that is suitable for all type of websites. It follows the best SEO practices and has optimized codes so as to deliver you important content to search engines. It is also optimized for better page speed. To talk about customization, you have a lot of options. First, you can choose primary color options. You can choose from 4 default layouts and 3 custom menu locations. It supports live customizer so, you can see the changes in the real-time preview. There are 6+ widget areas and widget options. You can add custom CSS to tweak the look and design of the theme as you like. Its responsive design and customizable features make it possible for you to create a professional and attractive website. CoverNews is an elegant free SEO WordPress theme that is perfect for an online blog and magazine. With the help of live customizer options and custom widgets, you can design your website as you like and preview the changes live. This theme is fully responsive that looks beautiful on all the screen sizes from small to large devices. It is also compatible with the WooCommerce plugin that helps you to integrate an online business with your blog easily. The theme is well optimized that helps to rank your website in the top of search engines. 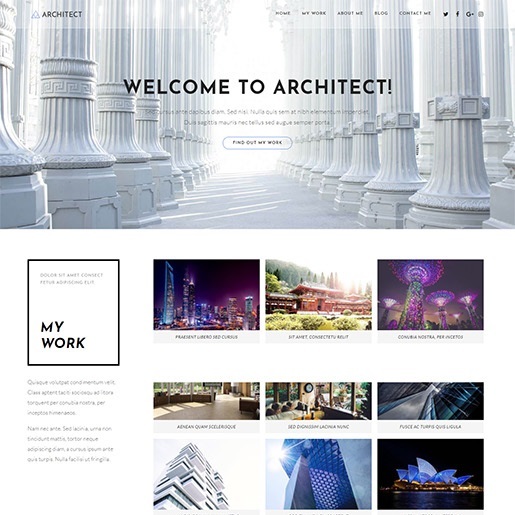 There are three demos available in this theme so choose the one you like and start to build a website. 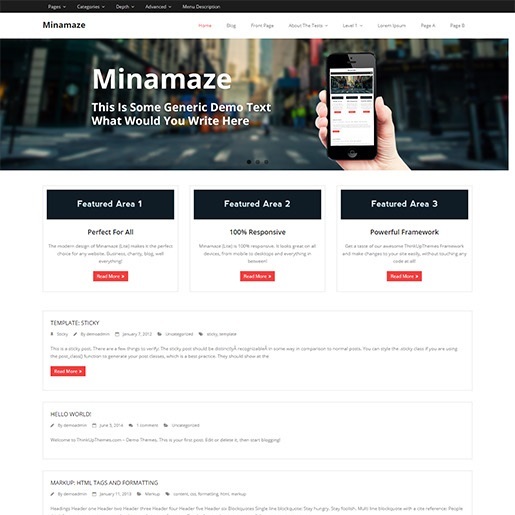 Minimaze is a visually stunning SEO WordPress theme that lets you create professional websites. It has a minimal design which is complemented with the colored buttons that show on hover. Firstly, it is designed to be SEO Friendly with optimized code and layout. It also has a responsive layout that makes your site look good on all devices and all screen sizes. It is even optimized for HD screens so your images always look sharp. You can also add links to your preferred social media profiles in seconds. This free theme is suitable for any type of website. It comes with a powerful theme options panel which can be used to make awesome changes without touching the code. It also offers 10 widgets options. Edge is yet another SEO WordPress theme that has optimized web pages and contents. This theme has SEO friendly features so, it makes your content easily discoverable for searching relevant terms. It is also responsive and is optimized to fit different screen sizes for any device. You can choose color options to customize the theme to fit your style. This theme provides infinite color options. You can choose any color scheme from the color options panel to fit your logo design. It has blog layout options as well as 4 footer column options. It also has 1 widget, 8 social icons, and 9 sidebars options. 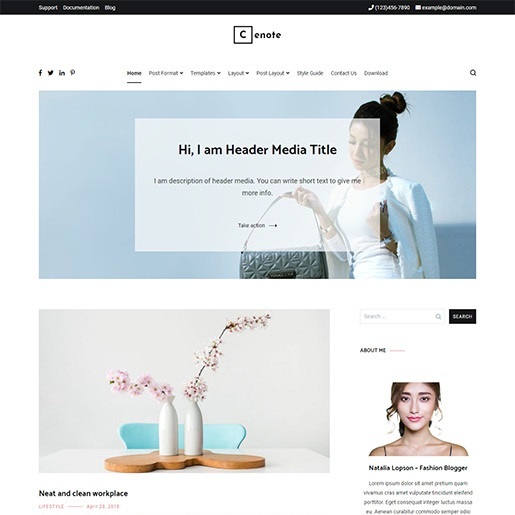 With WooCommerce compatibility, you can use this theme to start an online business. Cenote is beautiful, clean, modern looking SEO WordPress theme which is best suited for blogging sites. It can be used for various type of blog sites such as personal, fashion, tech, travel and many more. 3 free demos are available for you to test for your site. Similarly, there are 3 header layouts and option for header info (phone number, address, email). 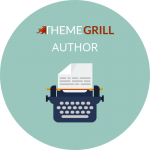 This theme offers many features like menu layout, post slider, breadcrumb, and standard fonts. You can also choose the primary color for your site that suits your needs. You can even link your social profiles with social icons support. It is translation ready so, your blog is ready to be translated to any language of your choice. 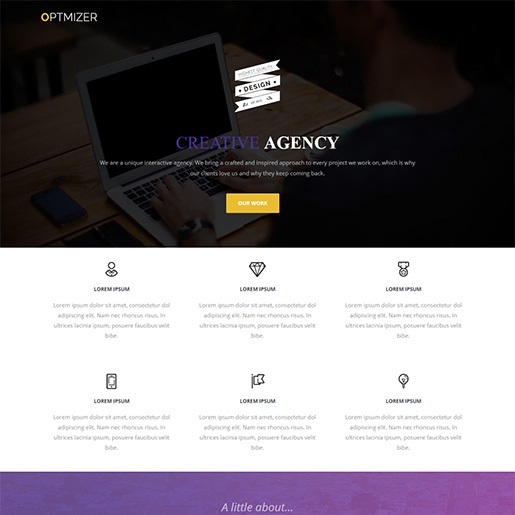 If you’re looking for a super flexible SEO WordPress theme, Optimizer is a perfect choice. It is fully SEO optimized and come with various SEO options. On top of that, you can use your favorite SEO plugins with ease. Not only this but, this theme is optimized for faster page load time. It is also coded with best practices which makes it 100% secure. Furthermore, it is fully mobile responsive and retina ready. Because of its responsive design, you can use this theme for any type of website. No matter what kind of content you add, it’ll look great on all devices. You can create your site with the drag and drop widgets. So, you can add any type of content easily. 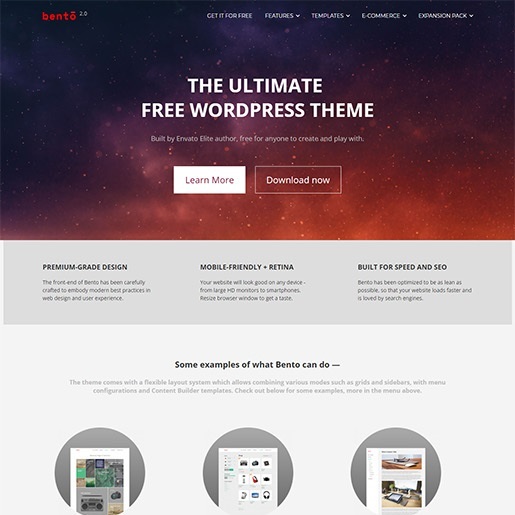 Bento is the ultimate free SEO WordPress theme that is powerful and user-friendly. It is SEO optimized as well as optimized for speed. It also adjusts automatically to any screen size of the viewing device. For a free theme, it has a lot of features to offer. To start, you can use the drag and drop content builder to get limitless possibilities. With this theme, you can set any color for any element of your site without messing with the code. It is also fully compatible with WooCommerce so, starting an online business is made easy. Moreover, this theme is extremely customizable with WordPress customizer tools. It lets you choose between a full- width and a boxed layout for your website. 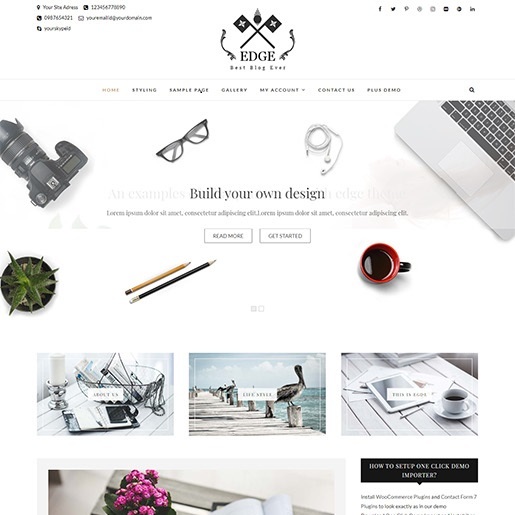 eStore is a great SEO WordPress theme for your WooCommerce website. It is completely responsive and SEO friendly. 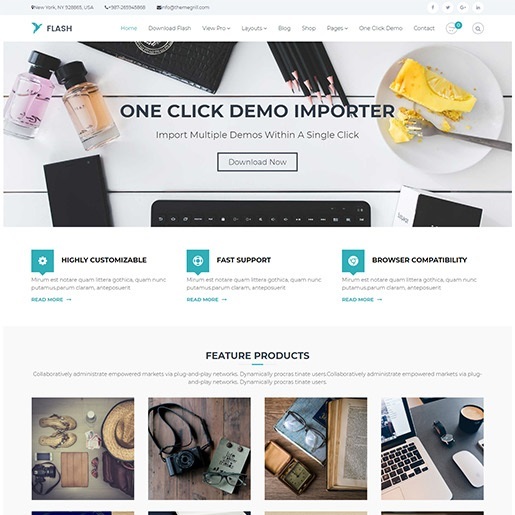 This theme is perfect if you want to manage your online business with WooCommerce integration. It also has advertisement spaces for you to add banners and AdSense Ads. eStore comes with amazing slider widgets to highlight your products or a specific category. You can customize this theme in real time with the live customizer. Moreover, it has 12+ custom widgets and 10+ widget areas. It has the primary color options for your site. This theme has demo content which makes it easy for you to set up your site. It also has RTL support and, it is WPML compatible. 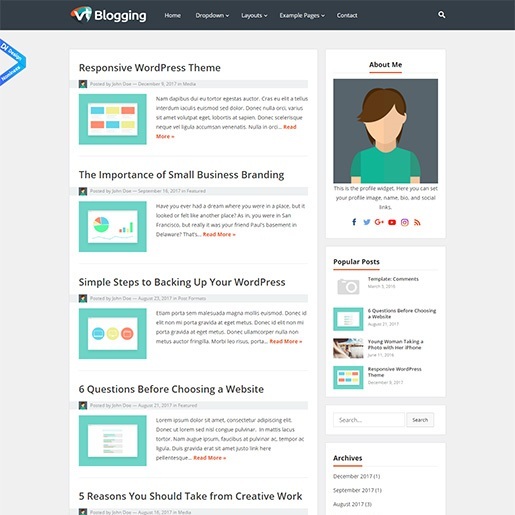 VT Blogging is the fastest free SEO WordPress theme that has a minimal and clean look. It implements SEO best practices so that your site ranks well. It is coded This theme is great for any type of blogging sites. 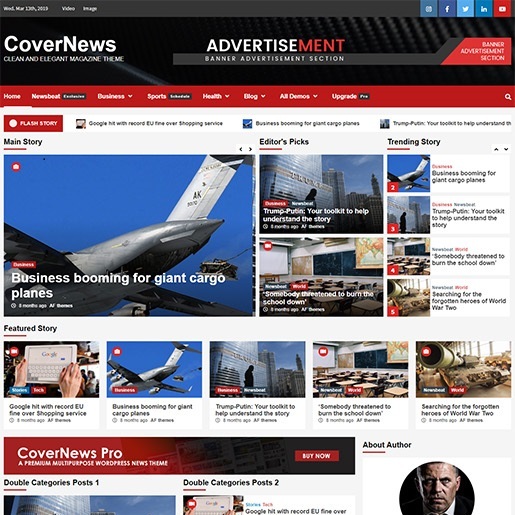 You can also use this theme for news, magazine, AdSense website, photography, etc. It is 100% responsive so, your site will look great on desktops and other devices. Likewise, this theme supports free and premium plugins like WPML for translating your site. It has a simple and clean layout and you can even make changes through the WordPress theme customizer. It offers custom widgets that allow you to display profile and link to your social networks. You can also add a widget to display the latest posts in the sidebar. Thus, there are many ways you can boost your site’s SERP ranking. You can start by installing an SEO WordPress theme because they help your site to have great SEO results. These themes are coded with best SEO practices in mind. Nowadays, all the great WordPress themes are SEO friendly. It has become an essential element for every site.